There’s an app for everything these days; literally. Your entire life can now fit conveniently in the palm of your hand. 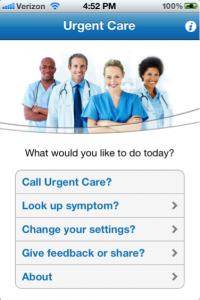 But have you ever thought of having an urgent care facility at your fingertips. Great Call, a company most popularly known for inventing the “Jitterbug phone” for elderly people, has now come up with a new app. Need a little more information. No problem! For the low, low cost of $3.99 the app can connect you to a registered nurse with the push of a button. Is the nurse not enough…not a problem. He or she can then put you in contact with a board-certified doctor. Talk about a smart app! If you’re a little skeptical than the real deal is still available. The Brentview Medical urgent care center in Los Angeles is open to all. With flu season in our midst you can come visit us if you think you’ve been bit by the bug. Our doors are open and our physicians are ready for anything and everything. Come to our Los Angeles urgent care facility when you need us.